It’s been over a decade since Bob Linsenman and Kelly Galloup’s “Modern Streamers for Trophy Trout” really took the idea of targeting big trout with big flies to the mainstream. Since then there have been tremendous advances – in gear, in fly design, in knowledge, and in the number of anglers hucking big meal to entice the river monsters out from under the log. Now a new book from Pennsylvania’s George Daniel has added to the must-read list for the streamer angler. 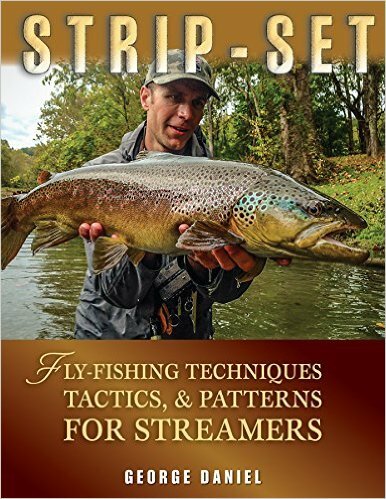 In “Strip-Set: Fly-Fishing Techniques, Tactics, Patterns for Streamers” Mr. Daniel takes all of these advances, mixes them with some insights from some of today’s top streamer purists, and delivers a tool to take your streamer fishing to the next level. Interestingly, the title topic – strip setting – is mentioned only briefly. As a recent convert to the muskie game, I understand the advantage of the strip set. But it also makes a ton of sense when pursuing trout. Trout-setting only moves the fly away from the fish, adds slack in the line, and generally lowers your odds of a solid hook-up. By contrast, a strip set creates immediate, positive contact. Makes perfect sense! This is but one example of the pragmatic, direct insight that Daniel presents in the book. Can’t wait for this Spring’s big trout hunt! Missed hooksets have been my nemesis in the past. For years a couple of my friends who are knowledgeable anglers have extolled to “fish the fly, not the line”. In principle, that sounds simple. But what does it MEAN? And how do you actually accomplish that goal? George Daniel delivers that answers at a level that totally changed my thinking and strategy. The book includes extensive discussions of line types – floating, sink-tip, and full-sinking – as well as when to deploy each type. Another interesting area is his extensive discussion of floating lines. Here in Michigan, we seldom fish streamers on a floating line. It’s generally a sink-tip or intermediate line match to current, depth, etc. At first I thought this to be just a quirk due to the fact the he spends most of his time fishing his native Pennsylvania (though it is clear from his book that he LOVES fishing Michigan) where the waters are typically not as deep. But before long I realized that he was really taking my knowledge to the next level – in some situations, even in deep water, there are significant advantages floating lines offer. This is a recurring theme in this book. There are a lot of tactics that can impact your success; consider them all carefully! These are but a few of the excellent topics covered in this solid book on the streamer game. Mr. Daniel writes in an engaging style, covers concepts thoroughly but not too extensively, and really addresses the gamut of issues, challenges, and conditions the streamer angler may encounter. This week I had the opportunity to meet and tie with George Daniel. His personality really reflected the book – straightforward, but with plenty of friendliness and no need for excessive flash. Speaking of flash; his patterns seem incredibly sparse alongside what we’re used to seeing here in Michigan. I’m eager to put my new knowledge, skills, and insights to work on my next streamer trip! 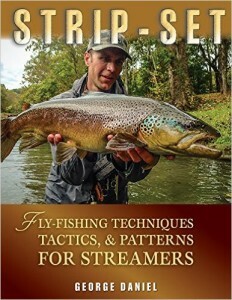 If you’re a streamer angler, put this book on your “must have” list. You won’t be disappointed!